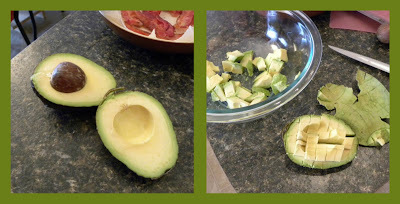 Here is another little tip that I learned while watching television: how to slice up avocado chunks...the easy way. Slice the fruit in half the long way, as shown in the photo. I do this by holding the avocado in my hand and circling around (tip to tip) with a knife. You won't (and don't) go all the way through because of the large pit. Once you have a knife path all the way around, gently twist the fruit...voila, you have two nice halves to work with. Next, run a knife from the outside of the flesh/fruit just to the inside of the skin. Do this all down the length of the fruit, and then repeat this action on the width, creating tiny squares. You can hold the fruit half in your hand for better control, just be careful not to go all the way through the fruit flesh and skin with the knife! Once you have all of the little squares, turn the half "inside out" or "invert the skin". The little squares should fall out, of at least come out very easily with a little help from your fingers. 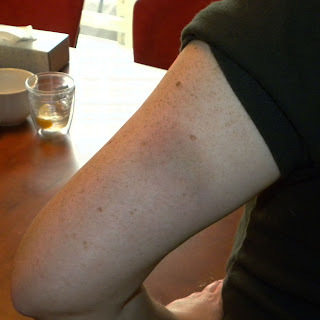 The above picture was taken exactly 2 weeks following the injection in this arm. Knowing that my arms are the least painful to inject, this wasn't a terrible injection. But the aftermath is shocking! There was no blood spill, not even a trickle. Just a little pea sized lump...how did that get there? First time for everything. This bruise in large, and it isn't getting better. I'm now at 3 weeks, and it still looks like this. Prior to the above injection, I had taken an "injection vacation": one week of giving my skin a break, injection free. Too many red spots, faded purple blotches, and sore areas. 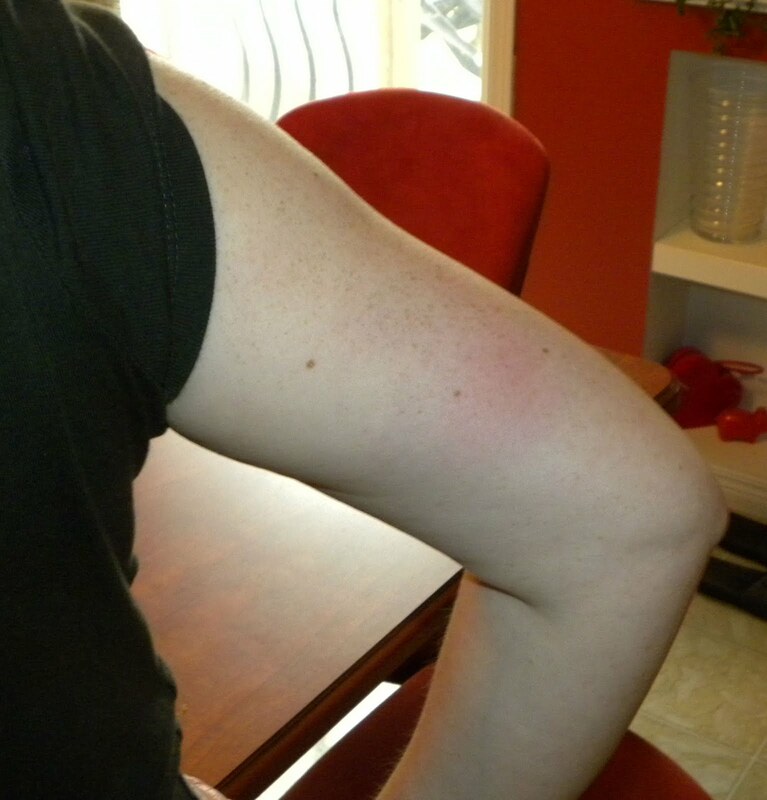 Last night, I checked my right arm in the mirror, looking for a spot to inject, only to discover the entire area was taken up by a red and purple tinge. Outer thighs, same thing. Back hips, same thing. So I'm on another injection vacation. So I ask, is this what they mean by not tolerating the medication? Are there long term consequences to these injection reactions? They only seem to be getting worse: I have been on Rebif for 3 years.